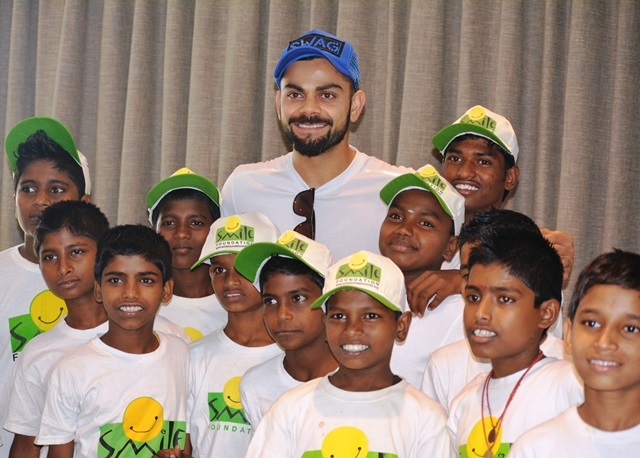 Virat Kohli Foundation has joined hands with Smile Foundation, a national level development organization, to support the cause of empowerment of underprivileged Children and Youth. As a first step towards this endeavor, a one-of-its-kind charity dinner in Mumbai is going to be organised in June. dinner, which will be attended by eminent cricketers, industry stalwarts, corporate honchos, bollywood personalities and achievers from diverse fields. The experiential evening will have a five course Michelin starred dinner curated by Chef Vikas Khanna for 200 distinguished guests. Also, there will be an auction of priceless, crème de la crème luxury items as well as high power entertainment to bring the evening alive. Today, more than half of India’s population is below the age of 25. India is touted to become one of the youngest countries by 2020 with average age being 29. However, nearly 8 million children in India are still out of school – on the streets, working in hazardous conditions, getting involved in illegal activities – far away from the innocence of childhood. The situation of our youth is no different. As per a latest Survey Report by the NSSO, the unemployment rate in India has increased substantially in the last two years with nearly 10.8 million unemployed young men and women. Thus, the soul behind this initiative is to raise awareness and support for the cause of education and skill training for the thousands of less privileged children and youth in India. Virat Kohli, is one of the most loved, followed youth icons of the day. The place he has created for himself in the hearts of millions’ of cricket lovers across the globe, at such a young age remains unparalleled. His association with social work brings admiration, not only from the cricket arena, but from every strata of the society. Through this initiative, he will be encouraging youth to reach for their aspirations and will also advocate, inspire and encourage more individuals to join the social movement. Michelin starred Chef Vikas Khanna, Global Ambassador for Smile Foundation has been advocating the cause of Nutrition for Education. According to Chef Vikas Khanna “Proper nutrition is crucial for our younger generation and to ensure that they are surging ahead towards building a stronger India. My association with Smile Foundation is towards ensuring that no child misses out on education because of the lack of nutrition. With the first ever auction of Utsav, I am reiterating my pledge to raise a MillionDollar4Nutrition to eradicate malnutrition in my heartland - India”. Chef Vikas Khanna has pledged to auction the 12th copy of the limited edition of “Utsav – a culinary epic of Indian festivals” at the event to support the campaign of #Milliondollar4Nutrition which aims at raising funds to support Nutrition for less privileged children, a cause that he has been supporting with Smile Foundation for more than 3 years . UTSAV celebrates Incredible India in all its glory and grandeur, while also supporting a cause very close to our hearts – of feeding underprivileged children across India. The book would be one of the 12 limited edition copies which will go to luminaries from around the world, including Prime Minister Narendra Modi, US President Barack Obama, Bill Clinton, Hillary Clinton and HH the Dalai Lama. An exquisite work of art with its cover and box hand-painted in 24-Carat Gold, what makes it extra special and a worthy collectible for the world’s best known humanitarians is that it features a hand written prayer in Tibetian by His Holiness the Dalai Lama. Incidentally, this 12th copy was meant for Steve Jobs and since he is no more, Chef Khanna gave it to Smile Foundation in the hope of being able to nurture the next “Steve Jobs” from India. “Virat Kohli is one of the most loved youth icons of the day, embodying the hopes, aspirations and dreams of millions of young people across the country. We appreciate philanthropic values of Virat Kohli Foundation. To have him support the cause of empowerment for children and youth strengthens our resolve to reach out to thousands of those unreached young people who are still struggling to come out of the vicious cycle of poverty and help them write their own destinies with the power of education.” Said Mr. Santanu Mishra, Co-Founder and Executive Trustee, Smile Foundation. Smile Foundation has been working intensively for the empowerment of children and youth through its education initiatives that provide them with quality education, skills training, proper nutrition, and relevant exposure and opportunities. With the two industry stalwarts Virat Kohli and Vikas Khanna joining this initiative, the movement will step in to the next phase of success. The evening will also witness an auction of high-end luxury products, some of the rarest of the rare experience, memorabilia of the cricketers, the proceeds of which will go towards the cause.